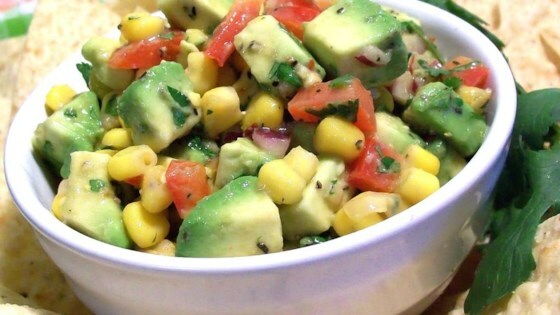 "Lime juice combined with avocados and corn make this yummy salsa go well with plain tortilla chips or with grilled chicken. Make just before serving for the best flavor and texture." Place kernels in a medium bowl. Stir in avocados, red onion, bell pepper, and garlic. Add cumin, red pepper flakes, and cilantro. Mix in vinegar, olive oil, and lime juice. Season with salt and pepper. A recipe such as this has a lot of variety – can be served as a dip or like a salad! I did not care for this recipe. I found the vinegar to be overpowering, the cumin too strong, and thought the flavors just did not go together. We have updated this recipe at the submitter's request. It now has cilantro in place of oregano. Everyone loved the salsa at my Spanish party, I made it the day before (without the avacado) and let it marinade over night. Put in the avacado right before everyone showed up.